We could sit for hours savouring .....crunching and eating every last bit of the sweet fleshy crabs!! Saute the onion, add in sauces. Simmer for a while. Add in crab. Cover and cook until crab is cooked. Last pour the beaten egg in and stir. Salt to taste. 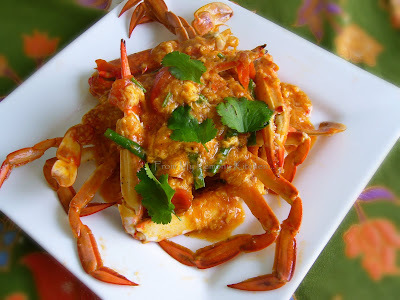 Note : measurement of the sauces - 'agak-agak' (approximate)......according to the number of crabs.